We are delighted to collaborate with MSA Coalition in USA to bring you the Global MSA Walkathon. This will be a chance for the MSA Community to virtually walk around the Globe to raise awareness of multiple system atrophy (MSA), fund support services for people affected by it as well as fund vital MSA research. The Coalition will have a map tracking their global progress as they start out from their offices in Charlotte, North Carolina and virtually walk to all the major organisations connected to MSA across the world. So, the Trust is on their route! The target is an astounding 52,000 miles which they hope to reach by World MSA Day, 3rd Oct. To find out more about the Global challenge click HERE. While we appreciate the fantastic target set for the Global challenge, the Trust invites you to set a virtual challenge and target for yourself between now and 3rd Oct (World MSA Day). We will add the miles you accumulate to the Global Walkathon campaign, and this way you are contributing to the global total! You are helping the MSA Community virtually walk around the world to raise awareness of a condition that is very rare and affects individuals and their families in a devastating way. Sounds like something you are ready to take on? Then visit the next tabs to register and also raise vital funds for the Trust while taking on this challenge. Remember, its virtual – You can take advantage of this and complete your challenge anywhere and anyway you like – while shopping, your daily commute to work, or even perhaps when you are on holiday enjoying the great outdoors! Setting a target that works for you – The recommended target is approximately 4.5 miles (10,000 steps) per day but less is perfectly fine. You can even pick a month between now and 3rd Oct, and set yourself a real challenge – 200 or even 300 miles a month! 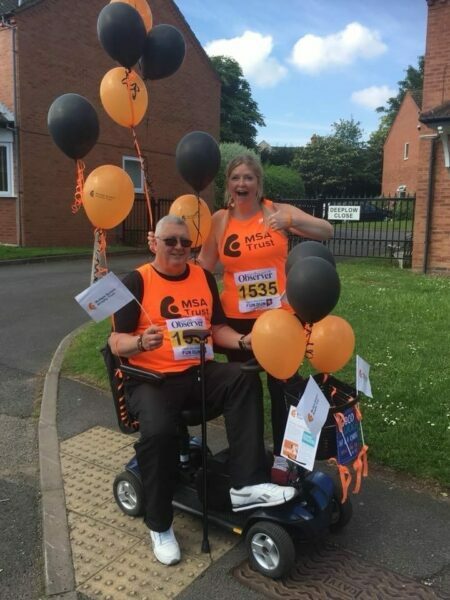 Every activity counts – You can walk, move using a power chair, jog, run or even cycle to accumulate the miles – everything counts! Please let us know why you decided to take part in the Global MSA Walkathon. This bit is easy, and you will be amazed how much friends and family are willing to support your new healthy lifestyle! Create a fundraising page for our Global Walkathon campaign. Make sure you link your fundraising page to your tracking app so that the miles covered show up on the page. Check out our step-by-step guide below to help you make this connection. Please note that funds raised would be coming directly to MSA Trust and will be used for supporting people and families affected by MSA, as well as funding MSA research. A portion (10%) would be donated to MSA Coalition as a thank you for inviting us to collaborate on this campaign.